Featuring an outdoor pool and garden views, Casita de Romina is situated in Puerto Real. Guests benefit from a terrace and a barbecue. The holiday home is equipped with 2 separate bedrooms and includes a kitchenette with a microwave, toaster and dining area. Providing air conditioning, the accommodation also offers a bathroom with a shower. Cádiz is 12 km from the holiday home, while Jerez de la Frontera is 16 km from the property. The nearest airport is Jerez Airport, 24 km from the property. Myself and my Spanish wife have lived in the same property for more than 13 years, with my mother in laws family owning the land for more than 50 years. We decided that due to the lack of unique holiday homes in our area, we would introduce ourselves to the market in creating our own little get away mainly for our children to enjoy when they grow up but in the meantime a retreat for all walks of life to enjoy in the meantime. Me, being English, and having lived in the area for 13 years means between us we have extensive knowledge to help our guests enjoy the very best of the surrounding area. We live adjacent to the property so any emergencies or questions can be helped with immediately. We have set up the holiday home as a real home from home and each year we make more improvements to offer our guests the most comfortable stay possible. 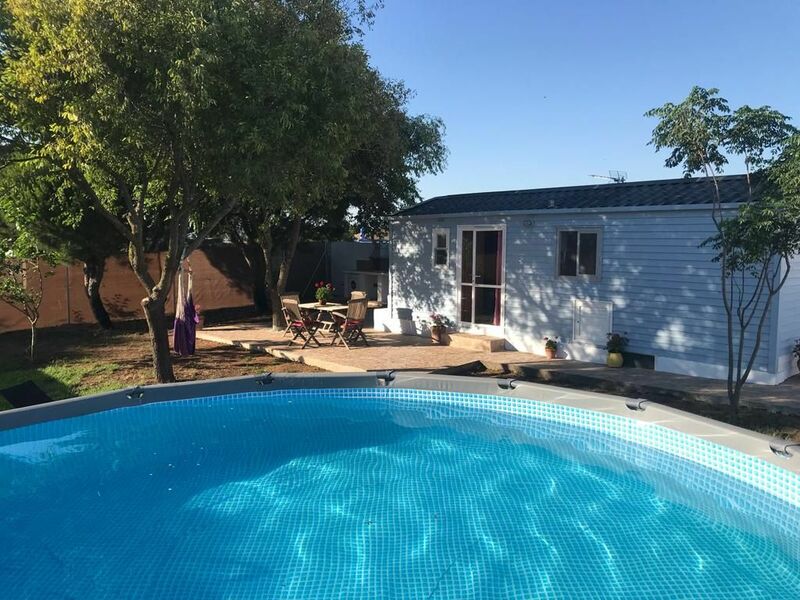 This property we felt was the right one for us after staying in numerous cabins, camping sites and so forth but all of those were crowded with other chalets touching, shared pools and gardens, and mainly no privacy. With its very own unique private garden of over 400 sq meters it really offers the renters a secluded retreat, with its own swimming pool, bbq and also benefits from both shade and sunny areas for all to enjoy. Air conditioning both hot and cold to cater for winter and summer let’s. Private swimming pool. Private off street parking and own entrance. Gardens and Outside Kitchen Space.